Good morning! A gorgeous day here in South Louisiana and I'm looking forward to a beautiful weekend! I haven't joined Pink Saturday in a while but have a little time this morning to do some pink browsing again with Beverly at How Sweet the Sound. I hope everyone is enjoying nice weather and having a good time too!! Today I'm sharing a birthday project today that I made for my great niece. I made a little coat hanger and crocheted around it. 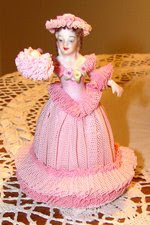 Then I crocheted a little cupcake and made a matching nightgown and robe for her American Girl. I love sewing and making things for those I love! I also made a gift for one of Katie's friends who had a little boy. His room is decorated with rockets so I appliqued a rocket and free motioned stitched a saying on a taggy blanket. Sweet babies. I'm so looking forward to Katie having her little boy Ollie any day now. More fun times ahead! Happy Pink Saturday to y'all all! For some reason I couldn't link to How Sweet the Sound all weekend so trying again. Great projects! You have been busy, and the little tag blanket is too sweet! Thank you so much for visiting my Blog Adorn and commenting on my hanging. This is such a sweet idea, very adorable. I love that hanger - what a cool gift! I just adore that little cupcake-wish I had a dozen of those!!! Happy Pink Saturday, suesue. As you can see, I'm running behind on visiting, but I'm always trying.